This Segovia day trip lets you experience four of Spain’s most incredible attractions, including three UNESCO World Heritage sites, with an expert guide. 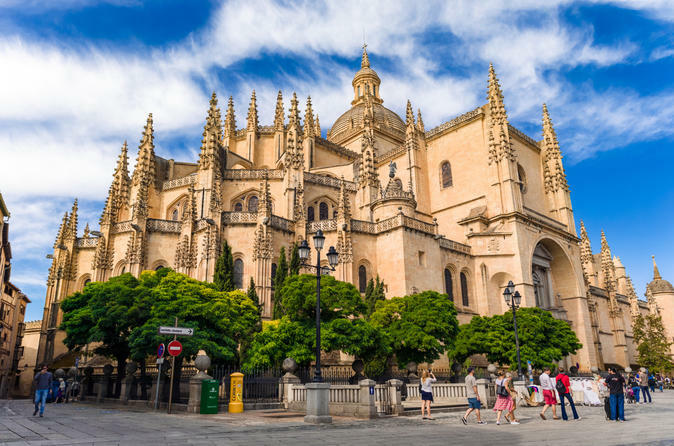 You’ll Take in Segovia’s historic old town, a magnificent Roman Aqueduct, a jaw-dropping gothic cathedral, and a medieval castle that inspired Walt Disney. Then you’ll end your day with a surprise highlight: El Escorial - the ancestral home of Spain’s Monarchs. You’ll take a guided tour of this enormous palace, including its most impressive rooms and the Pantheon of Kings, a monumental tomb for generations of Spanish royals. Meet your guide and group in Central Madrid, then board a private, air-conditioned transport for your hour-long trip to Segovia. Your first stop is the stunning Alcázar of Segovia, a medieval castle and World Heritage Site that inspired Walt Disney to create his fairytale castles. Inside see armor, canons, tapestries, stained glass, ancient furniture, and more as you enjoy a full guided tour. Next, walk through Segovia’s World Heritage old town to the beautiful, gothic Cathedral for a highlights tour. Then head over to the best viewpoint of the nearby Roman aqueduct, your final World Heritage site. This is one of the oldest, largest, and all around most impressive Roman monuments in the world; it’s sure to blow you away. After a break for lunch (not included) you’ll drive to El Escorial, the ancestral residence of the kings of Spain. It’s a palace, monastery, school, and royal crypt all rolled into one - a truly magnificent monument to the ancient royal families of Spain. Your guide will show you around and take you to see the Pantheon of the Kings, the monumental tomb holding the coffins of 26 kings and queens from the Habsburg and Bourbon dynasties. Segovia is one of the most beautiful and culturally-rich cities in the world and this day trip lets you explore it without worrying about any of the logistics; all you have to think about is what to ask your guide next.